In music, a single or record single is a type of release, typically a song recording of fewer tracks than an LP record or an album. This can be released for sale to the public in a variety of different formats. In most cases, the single is a song that is released separately from an album, but it usually appears on an album. Often, these are the most popular songs from albums that are released separately for promotional uses such as digital download or commercial radio airplay, and in other cases a recording released as a single does not appear on an album. The basic specifications of the music single were made in the late 19th century, when the gramophone record began to supersede phonograph cylinders in commercial music. Gramophone discs were manufactured with a range of playback speeds (from 16 rpm to 78 rpm) and in several sizes (including 12-inch/30 cm). By around 1910, however, the 10-inch (25 cm) 78 rpm shellac disc had become the most commonly used format. The inherent technical limitations of the gramophone disc defined the standard format for commercial recordings in the early 20th century. The relatively crude disc-cutting techniques of the time and the thickness of the needles used on record players limited the number of grooves per inch that could be inscribed on the disc surface, and a high rotation speed was necessary to achieve acceptable recording and playback fidelity. 78 rpm was chosen as the standard because of the introduction of the electrically powered synchronous turntable motor in 1925, which ran at 3600 rpm with a 46:1 gear ratio, resulting in a rotation speed of 78.26 rpm. With these factors applied to the 10-inch format, songwriters and performers increasingly tailored their output to fit the new medium. The 3-minute single remained the standard into the 1960s when the availability of microgroove recording and improved mastering techniques enabled recording artists to increase the duration of their recordings. The breakthrough came with Bob Dylan's "Like a Rolling Stone", although CBS tried to make the record more "radio friendly" by cutting it in half and spreading it over both sides of the vinyl, both Dylan and fans demanded that the full six-minute take be placed on one side and that radio stations play the song in its entirety. The subsequent success of "Like a Rolling Stone" played a big part in changing the music business convention that singles had to be under three minutes in length. Singles have been issued in various formats, including 7-inch (18 cm), 10-inch (25 cm), and 12-inch (30 cm) vinyl discs (usually playing at 45 rpm); 10-inch (25-cm) shellac discs (playing at 78 rpm); cassette, 8 and 12 cm (3- and 5-inch) CD singles and 7-inch (18 cm) plastic flexi discs. Other, less common, formats include singles on digital compact cassette, DVD, and LD, as well as many non-standard sizes of vinyl disc (5-inch/12 cm, 8-inch/20 cm, etc.). The most common form of the vinyl single is the 45 or 7-inch, the names are derived from its play speed, 45 rpm and the standard diameter 7-inch (18 cm). 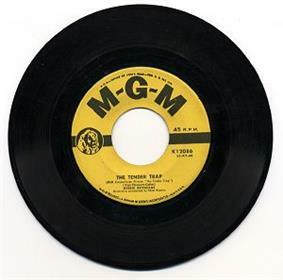 The 7-inch 45 rpm record was introduced in 1949 by RCA as a smaller, more durable and higher-fidelity replacement for the 78 rpm shellac discs. The first 45 rpm records were monaural, with recordings on both sides of the disc. As stereo recordings became popular in the 1960s, almost all 45 rpm records were produced in stereo by the early 1970s. Although 7 inches remained the standard size for vinyl singles, 12-inch singles were introduced for use by DJs in discos in the 1970s. The longer playing time of these singles allowed the inclusion of extended dance mixes of tracks. In addition, the larger surface area of the 12-inch discs allowed for wider grooves (larger amplitude) and greater separation between grooves, the latter of which results in less cross-talk. Consequently, they "wore" better, and were less susceptible to scratches. The 12-inch single is still considered a standard format for dance music, though its popularity has declined in recent years. Depending on its type, in addition to the song itself, a single may include remixes of the song, additional songs, a music video for promoting the single, and a collectible poster. The sales of singles are recorded in record charts in most countries in a Top 40 format. These charts are often published in magazines and numerous television shows and radio programs count down the list. In order to be eligible for inclusion in the charts the single must meet the requirements set by the charting company, usually governing the number of songs and the total playing time of the single. In popular music, the commercial and artistic importance of the single (as compared to the EP or album) has varied over time, technological development, and according to the audience of particular artists and genres. Singles have generally been more important to artists who sell to the youngest purchasers of music (younger teenagers and pre-teens), who tend to have more limited financial resources. Perhaps the golden age of the single was on 45's in the 1950s to early 1960s in the early years of rock music. Starting in the mid-sixties, albums became a greater focus and more important as artists created albums of uniformly high quality and coherent themes, a trend which reached its apex in the development of the concept album. Over the 1990s and early 2000s, the single generally received less and less attention in the United States as albums, which on Compact Disc had virtually identical production and distribution costs but could be sold at a higher price, became most retailers' primary method of selling music. Singles continued to be produced in the UK and Australia, surviving the transition from compact disc to digital download. The discontinuation of the single has been cited as a major marketing mistake by the record companies considering it eliminated an inexpensive recording format for young fans to become accustomed to purchasing music. In its place was the predominance of the album which alienated customers for the expense of purchasing an expensive format for only one or two songs of interest. This in turn encouraged interest in file sharing software on the internet like Napster for single recordings initially which began to seriously undercut the music recording market. Dance music, however, has followed a different commercial pattern, and the single, especially the 12-inch vinyl single, remains a major method by which dance music is distributed. Single sales in the United Kingdom reached an all-time low in January 2005, as the popularity of the compact disc was overtaken by the then-unofficial medium of the music download. As a result, downloads were gradually introduced into the UK Singles Chart from April 2005 to January 2007. Sales gradually improved in the following years, reaching a record high in 2008 and that further being overtaken in 2009, 2010 and 2011. Portable audio players, which make it extremely easy to load and play songs from many different artists, are claimed to be a major factor behind this trend. A related development has been the popularity of mobile phone ringtones based on pop singles (on some modern phones, the actual single can be used as a ringtone). In September 2007, Sony BMG announced they would introduce a new type of CD single, called "ringles", for the 2007 holiday season. The format included three songs by an artist, plus a ringtone accessible from the user's computer. Sony announced plans to release 50 ringles in October and November, while Universal Music Group expected to release somewhere between 10 and 20 titles. In a reversal of this trend, a single has been released based on a ringtone itself. The Crazy Frog ringtone, which was a cult hit in Europe in 2004, was released as a mashup with "Axel F" in June 2005 amid a massive publicity campaign and subsequently hit #1 on the UK charts. The term "single" is sometimes regarded as a misnomer since one record usually has 2 songs on it, when considering the "A" and "B" sides. In 1982, CBS marketed one-sided singles at a lower price than two-sided singles. On 17 April 2005, Official UK Singles Chart added the download format to the existing physical CD singles. Selling on downloads alone Gnarls Barkley was the first act to reach No.1 in April 2006. It was released physically the following week. On 1 January 2007 digital downloads (including unbundled album tracks) became eligible from the point of release, without the need for an accompanying physical. ^ Greil Marcus, 2005, Like A Rolling Stone, p. 145. ^ a b Britt, Bruce (August 10, 1989). "The 45-rpm single will soon be history". Spokesman-Review. (Los Angeles Daily News). p. C4. ^ Knopper, Steve (2009). Appetite for Self-Destruction: The Spectacular Crash of the Record Industry. Simon and Schuster. pp. 105–7. ^ Christman, Ed (2007-09-09). "Music industry betting on 'ringle' format". ^ "OCC test charts reveal likely effects of rule changes". ^ "Download Official UK Single Chart Rules - PDF". The Official Chart Company. 2009. Archived from the original on 2011-08-18. ^ "The Official UK Charts Company : Info pack from The Official UK Charts Company". Archived from the original on 2011-08-18. The 45 Adaptor—A short article looking at the history of the 45 rpm single spindle adaptor.